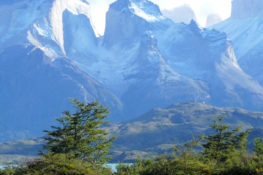 A comprehensive and off-the-beaten path Patagonia experience, this trip marries Chile and Argentina by way of a flexible small-ship expedition cruise through remote fjords, the historic Beagle Channel, and the Straight of Magellan; capped off with a flexible adventure lodge stay to explore the region’s crown jewel, Torres del Paine National Park. Also discover dazzling Buenos Aires and Santiago. Argentina’s capital city, where treasured history and new styles intersect and thrive. Explore the breathtaking southernmost points of Argentina & Chile on this extraordinary Patagonia cruise. Take in the majesty of the Patagonian wilderness as it stretches out before you. Wander the hills of Valparaíso, soaking in its colorful and captivating street art. Discover the cultural and historic treasures of Santiago as you explore Chile’s capital city. *Price approximation reflecting seasonality and room category. All Knowmad trips are custom and quoted individually. Arrive to Buenos Aires and be brought to your hotel. Enjoy the rest of the afternoon at your leisure, soaking in the unique architecture, beautiful plazas, and colorful culture of this famed city. Head out today for your guided half-day exploration of Buenos Aires, seeing the most important sights and centerpieces of this eclectic city. Dive into its culturally rich neighborhoods such as San Telmo, La Boca, and Recoleta. Interesting features of Argentine society in the city are highlighted; such as its historic development, immigration process, specific cultural topics (soccer, tango music), architectural heritage, Peronism, and more. Enjoy one more morning at your leisure in incredible Buenos Aires before flying to Ushuaia. Upon arrival, spend the rest of the day independently exploring Argentina’s southernmost city or relaxing. Journey to the ‘End of the Earth’ for a full-day excursion through the most southern national park in the world. Experience the unique and impressive landscapes of Tierra del Fuego, hiking on easy to moderate trails through the dense green forest with the insight and support of an expert, private guide. At the end of your excursion, board the Australis Cruise; during the night you will traverse the Beagle Channel and cross from Argentine to Chilean territorial waters. Sail through Murray Channel and Nassau Bay to reach Cape Horn National Park, declared a World Biosphere Reserve by UNESCO. The legendary Cape Horn was an important navigation route between the Pacific and the Atlantic. Discovered in 1616, it is a sheer 425-meter (1,394-foot) high rocky promontory. In the afternoon, you will go ashore at historic Wulaia Bay, originally the site of one of the region’s largest Yamana aboriginal settlements, and also renowned for the mesmerizing beauty of its vegetation and geography. Take an enchanted walk through a forest of lengas, coigües, canelos, ferns, and other endemic vegetation, to reach a panoramic viewpoint before returning to the ship for an evening at your leisure. Overnight you will sail through the Gabrial, Magdalena, and Cockburn channels arriving to the Pía Fjord by morning. Today you will board the Zodiacs for a shore excursion to Pía Glacier where you’ll have the option to take a shorter or longer, more challenging, hike to a spectacular glacier. Return to the ship to continue on to the Garibaldi Glacier, one of only three glaciers in Patagonia gaining mass. Stay onboard enjoying the stunning panoramic view of the glacier from the upper decks, or hike through the Magellanic forest to a glacial waterfall and incredible viewpoints looking down on the glacier and fjord. Early in the morning, you will enter the awe-inspiring De Agostini Sound, in the heart of the Darwin Mountain Range. This is where you may see glaciers sliding down the mountainside all the way to the sea. You will disembark for an easy walk around the lagoon, formed by the melting of the Águila Glacier, arriving to the face of the glacier. It’s the perfect opportunity to experience the beauty of Patagonia’s cold forest and to see how the power of nature has molded the spectacular landscape. In the afternoon, you will board the Zodiacs to the Cóndor Glacier where you might see the Andean Condors known to the area. Go ashore Magdalena Island, inhabited by an immense colony of Magellan Penguins, located in the middle of the Strait of Magellan. Disembark from the cruise in Punta Arenas, and head on the approximately 3-hour scenic drive to your luxury accommodations. Located in a recovered building from the early 20th century, the Singular Patagonia is a piece of living history, and includes a private historical on-site museum. While at Singular Patagonia you will be able to choose from a wide range of daily excursions, including kayaking, horseback riding, glacier boating, wine tastings, and more. Also, enjoy gourmet food and a range of wines and alcohol included in your stay. Continue enjoying your adventures throughout the region, accessing Patagonia’s crown jewel, Torres del Paine National Park. Endless trails of varying difficulty are set amongst an inspired backdrop of jagged granite peaks, massive glaciers, cascading waterfalls, and turquoise lakes and rivers. After breakfast, return to Puntas Arenas for your flight to Santiago. Spend the rest of the day at your leisure, independently exploring Chile’s capital. Perhaps visit the nearby Plaza de Armas, or main square, located only a few blocks away from your hotel. Here, you can take in the lovely colonial architecture of some of the city’s most beautiful buildings. The Lastarria area is also home to wonderful museums, and excellent dining options. Head out this morning on the approximately 90-minute drive west to the coastal city of Valparaíso, once the most important seaport of the Pacific coast and declared a UNESCO World Heritage site. Visit both the downtown and the colorful hill neighborhoods of ‘Valpo’ where century-old hillside ascensores (elevators) rise up into the city’s steep hills and a labyrinthine maze of streets reveals brightly colored buildings, bohemian cafes, elegant restaurants and breath-taking views of the harbor below. After exploring the city, you will head toward the Casablanca Valley and visit unique wineries in the valley. Here you will enjoy a tour, as well as a lunch with a tasting of their distinct varieties. Return in the evening to your hotel in Santiago. Enjoy the morning at your leisure. In the afternoon you’ll head out on your guided exploration of Santiago, beginning at the beautiful park on Santa Lucía Hill. Continue on to the governmental seat of Palacio La Moneda, the House of Justice, and the National Parliament. Along Plaza de Armas, the main square, you will visit the Cathedral and view the majestic architecture of the Post Office and governmental buildings. Enjoy sightseeing and people watching in this city that has been bustling with life from colonial times to present day. Following your day’s exploration, you will be brought to the airport for your international, overnight flight home. Airfare is not included in the land cost of our trips. You may arrange your airfare independently, or we are happy to offer assistance in helping you book it. Regional flights for this trip would include: Buenos Aires – Ushuaia and Punta Arenas or Puerto Natales – Santiago. DurationHave a longer or shorter amount of time to travel? We’ll guide you on the best days to pull or ways to extend your adventure, possibly with travel to another region. accommodation upgrades or AlternativesFrom backcountry camping in tents to luxury, boutique hotels, Knowmad handpicks accommodations based on our travelers’ desires. Talk with us about the nuances of the variety of properties featured in our trips to find the best fit for you. Visit another regionMaybe wine country or an Andean pueblo has caught your eye, but it’s not in this itinerary. Knowmad Trip Specialists are experts at coordinating inter-regional travel, considering sequencing and the best duration to spend in each destination depending on your interests and travel style.